Finding a perfect job can be challenging and even more so for the OPT/CPT candidates due to limited time period. Upgrade your resume to priority and get noticed by as many recruiters as possible. Your resume will be highlighted and displayed on top of the search results for our employers, giving you a greater visibility for the next 15 days. So what are you waiting for? Resume Prioritize service is available at a one-time minimal fee of $10 only. 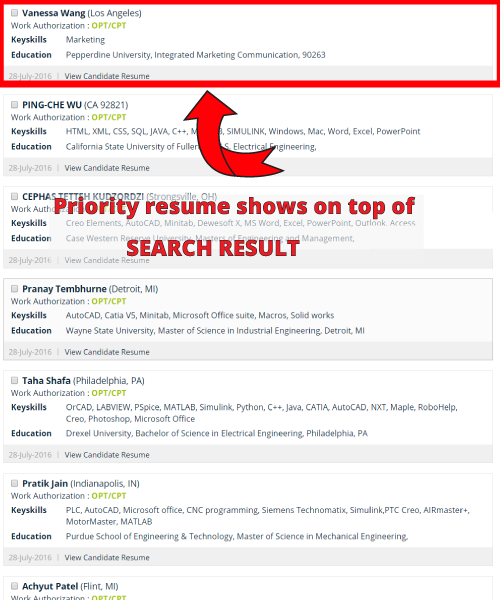 Just click on ‘Upgrade to Prioritize Resume’ button below now get an incredible response from the employers for the latest job requirements. Find the below example of upgrading your resume. Do you want to try for just $10 our Resume Boost Service for 15 days?